Soak the cashews in boiling water for 30 minutes. Cut potatoes in bite-sized pieces and boil in water until they are cooked but not fully soft. Add the cashews, lemon juice, onion powder, rice vinegar, pepper, salt and water to a blender. Blend until smooth. 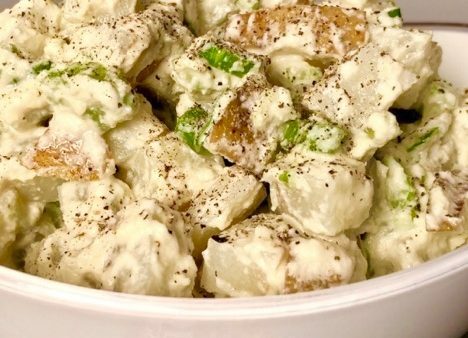 In a large bowl mix the potatoes with the dressing. Add the diced green onion and celery. Cover with plastic wrap and refrigerate for 1 hour. Enjoy!